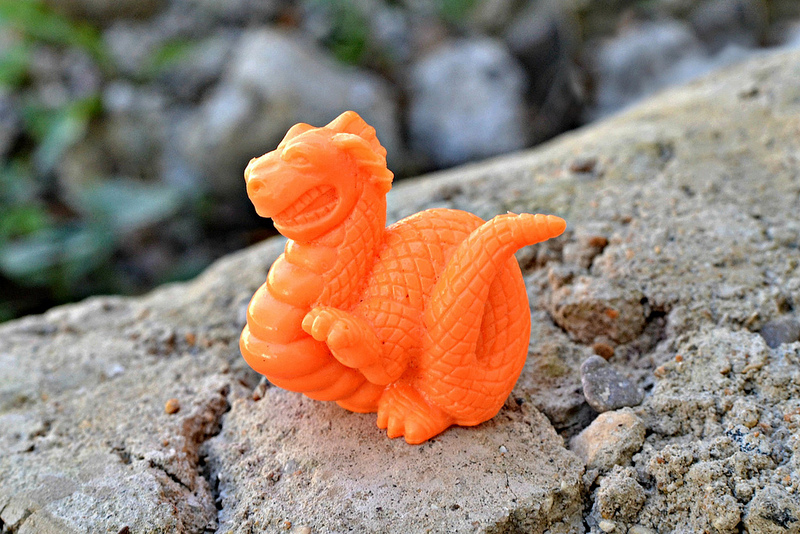 Since Monster in My Pocket is one of the biggest, most collectible, and arguably one of the greatest lines of little weirdos ever, I thought it was about time to start highlighting some of its individual series. To start I'm focusing on Series 3, which includes some of the most popular and desirable figures of the entire line, thanks to its rarity. Way back when MIMP toys were on store shelves, most kids who collected the line didn't even realize there was a Series 3. In my area, Series 2 never even made it to stores, so I had to settle for only Series 1 and the less cool, larger and painted "Super Scary" series that came later. I guess it's a good thing I didn't know about Series 3 figures back then because there was no way I could have gotten them and it would have just added to the frustration created by not being able to track down the second series! 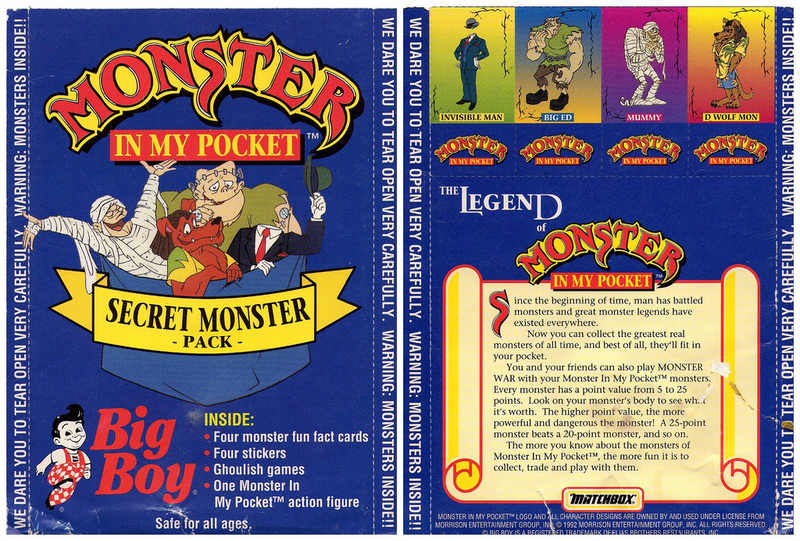 Monsters 73-80 were released two ways in 1992: As Canadian cereal premiums in boxes of Nabisco Shreddies and as kids meal premiums in "Secret Monster Packs" at Big Boy restaurants in the U.S. There was no U.K. release (where MIMP seems to have been post popular), and even though they saw a U.S. release at Big Boy, there were not a lot of those restaurants around. Kids would have been much less likely to have a Big Boy in their area than a McDonald's or Burger King, for example. This limited distribution means that Series 3 figures are some of the most desirable and difficult to find MIMP figures today. There are some variations between the Shreddies and Big Boy figures. 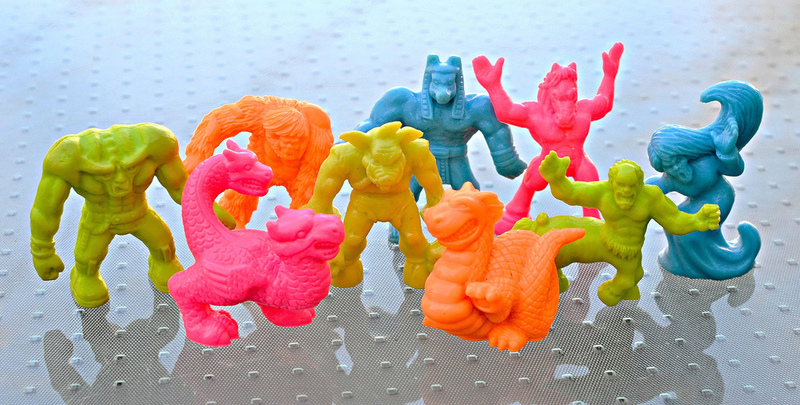 The Shreddies figures were all produced in the typical MIMP soft plastic and came in either neon blue, neon orange, neon pink, or light green. The same is true for the Blemmyea figures that came with the NES game. The Big Boy versions swapped blue for purple, and the three other colors differed slightly as well (most noticeably the green, which was even paler and more yellowish). 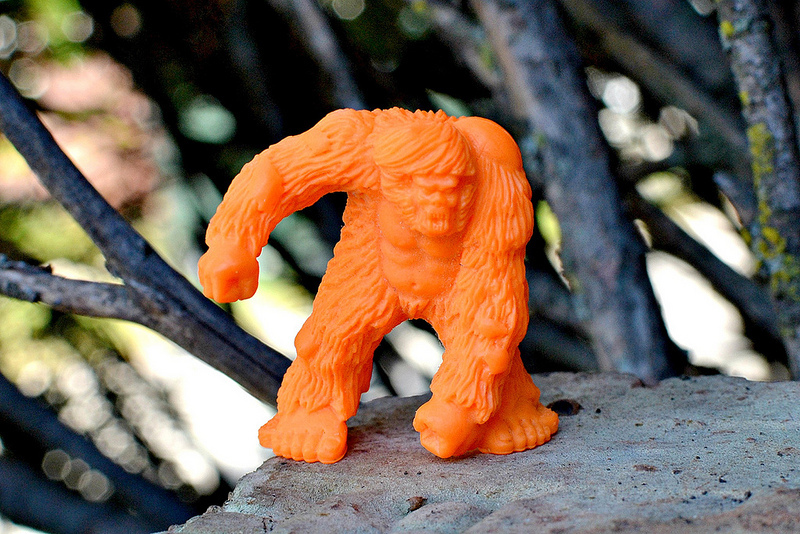 In addition, for some reason certain Big Boy figures were made out of a firmer, more MUSCLE-like plastic. So what happened to monsters 82 through 96, the numbers before the Super Scary figures begin? 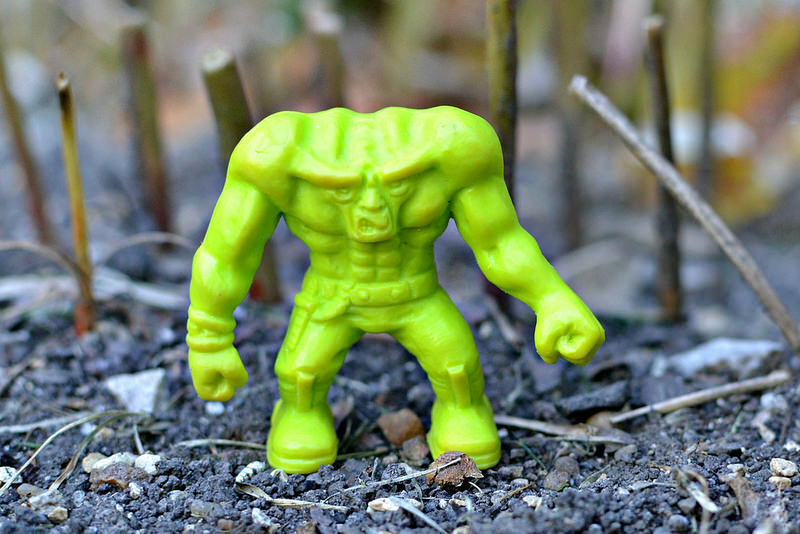 Those monsters--the remainder of Series 3--are presumed to have never been released in any way, and any evidence of sculpts has not been found. Thanks to artwork from a MIMP sticker book from Argentina, though, we know which monsters would have rounded out the third series. They include: Achelous, Ankou, Banshee, Catarenha, Djinn Shapeshifter, Genie, Grendel, Hairy Boggart, The Headless Man, Hieracosphinx, Hodag, Jabalius, Sciapod, Talus, and Troll. 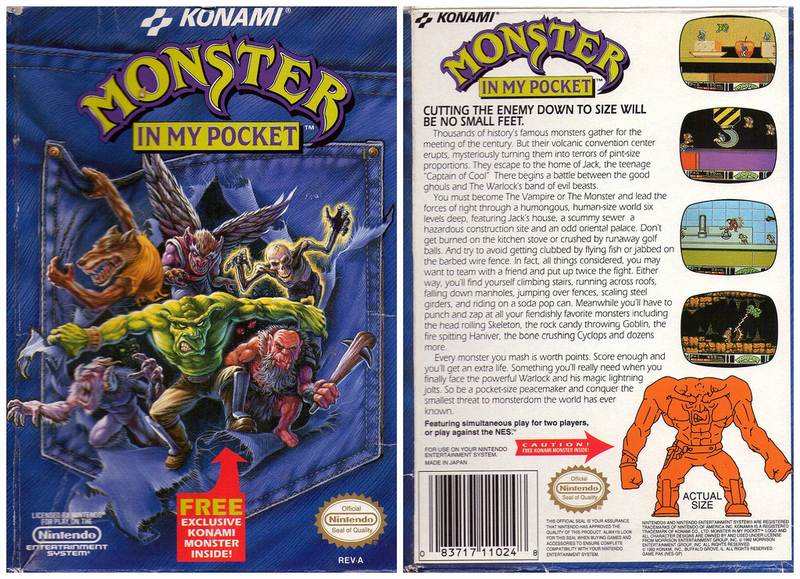 You can see the sticker artwork for each of these monsters here. BLEMMYEA: As I mentioned, this is the only Series 3 figure I had as a kid, and I carried it around so much that it started to look a bit discolored and worn out. I guess that means I've always been a fan of this one. I love his snarling expression and the brutish design. LEVIATHAN: This sea serpent is one of my favorites from the set. I really like the textures of the sculpt, from its scales to the smooth segments on its underside. ANUBIS: I always thought the MIMP depiction of this Egyptian god looked pretty tame and not too monster-like. His facial expression actually looks kind of happy and friendly. OROBAS: This horse-man demon is a pretty cool-looking figure, even though he's another one that doesn't look too monstrous. Its pose seems to be based on an early woodcut image of Orobas. Fun fact: This figure was only available in Shreddies boxes, and not the Big Boy packs. JIMMY SQUAREFOOT: This is a Scottish monster with the head of a pig, and you can't really go wrong with a pig-headed monster. 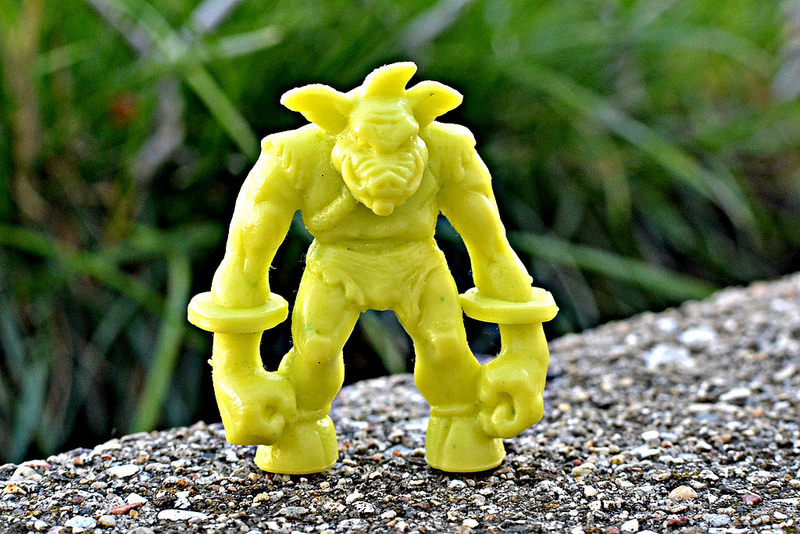 The particular figure shown above came from a Big Boy pack--notice how the green has a bit of a lighter, more yellow look than the other green figures in this post, which came from Shreddies boxes. ABOMINABLE SNOWMAN: Another favorite. I just love this sculpt of this yeti, including the overall pose, the angry facial expression and the texture of the fur. SIREN: Part of me likes the simplicity of this figure, but I also kind of feel like they could have done something more interesting with the sculpt. Maybe they could have exposed the fishtail lower half with some cool scaly texture and detail instead of covering up the entire body with the gown. 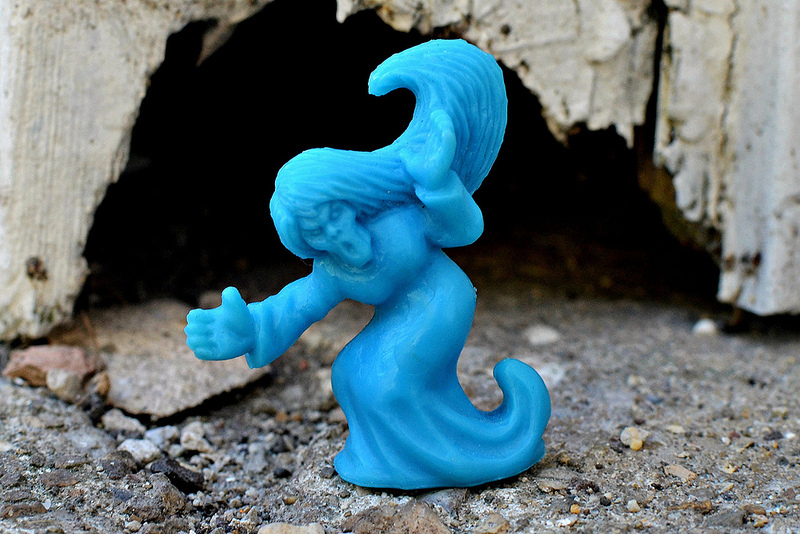 In any case, I'm glad the Siren figure got released as Sirens are some of the most well-known creatures in mythology, and it would have been a shame if there wasn't one in the MIMP collection. AMPHISBAENA: The nine figures that got released from Series 3 offered up a nice variety of monster types, and this two-headed beast covers the reptilian/serpent category nicely along with Leviathan. 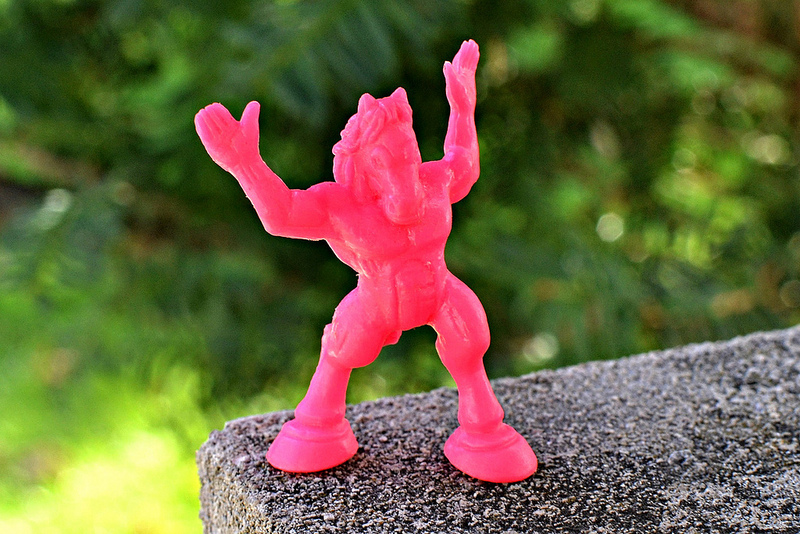 I think it looks extra cool in this neon pink color, too. 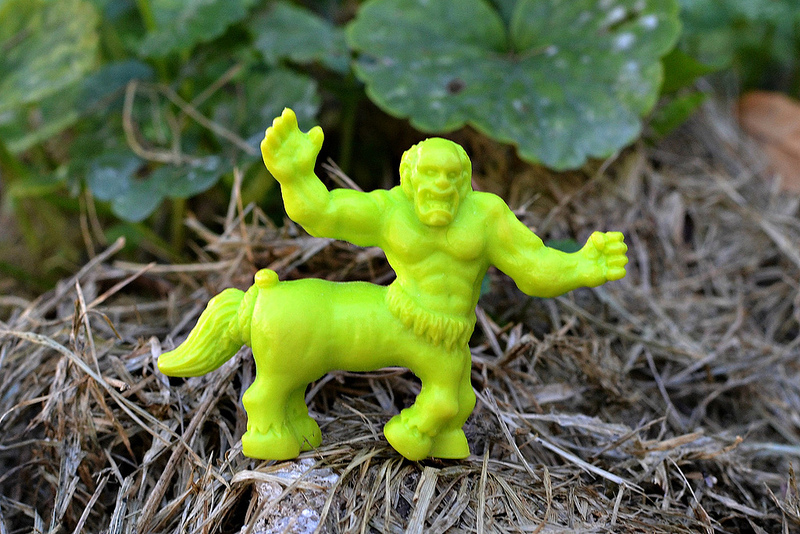 CENTAUR: As with Siren, I'm glad this figure made it out because Centaurs are such a staple of mythology, but I've always thought this figure was a bit too small when compared to some other MIMP. Points for grumpy facial expression and the random snake wrapped around its tail, though. 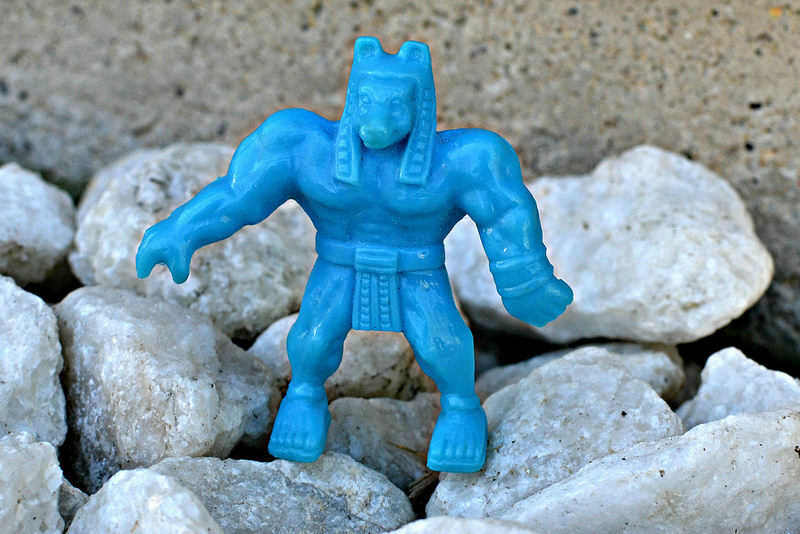 Fun fact: Some of the Big Boy versions of this figure have bracelets sculpted on their arms. And that's MIMP Series 3! What do you think of this set? Do you have any in your collection? My buddy had the Nintendo monster. 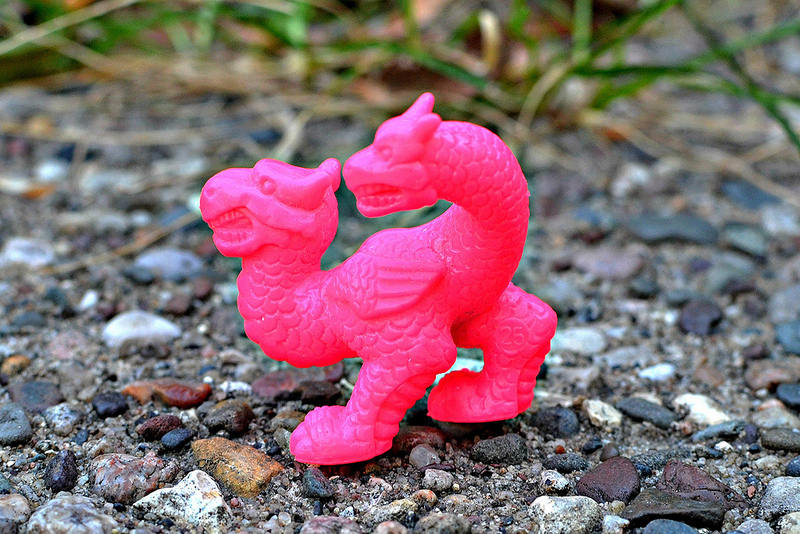 I bought AMPHISBAENA at a flea market as a kid. He's the only series 3 monster I own. Nice flea market find! Was it a Big Boy one or a Shreddies one? i have question for pricing about this serie (canadian serie 3) is there an admin that can write to me?